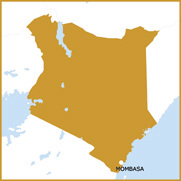 Mombasa is the second largest city in Kenya; it is the capital of the district and the Coast Province. It is located on an island separated from the mainland only by two small rivers. It has a major port and an international airport, and is the centre for coastal tourism. The original Arabic name of the city is Manbasa; Kiswahili is called Kisiwa Cha Mvita (Mvita for short), which means "Island of War", In the past there were many struggles for control of the city.